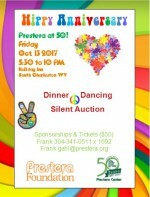 The 2017 Prestera Foundation's Fall Benefit is set for Friday, October 13th, 2017 at the Holiday Inn, South Charleston WV. The theme for the event is "Hippy Anniversary" as Prestera Center celebrates 50 years of comprehensive behavioral health services. Doors open at 5:30. There will be dinner, dancing and a silent auction. Music will be provided by Rubber Soul. Tickets are only $50 and corporate sponsorships are available - call Frank Gahl, 304-341-1511, extension 1692.